We walked into the centre of the village today to pick up and post our mail, and to get a few groceries. I was thrilled to find my favorite fat free Balkan style yogurt and my favorite broccoli slaw on sale. Little things make me happy. On the way home my left calf started to cramp a bit so I made sure to do some stretching and drink some tonic when we arrived back on board. I am trying to get into a habit of doing at least a few leg stretches every day so the ache was a good reminder. 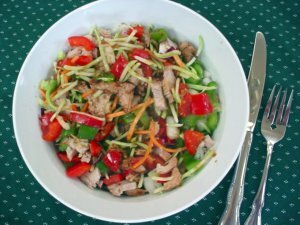 And then I had to use have some of that broccoli slaw in my lunch - with some of last night's BBQ'd pork tenderloin, onions, peppers and my own soy ginger dressing. Delicious. I love Crunch Lunch. That must be water droplets on my knife. Late this afternoon we went for another, shorter walk... looking for those goslings we found the other day. I want to see them again before they outgrow all their yellow down and sprout grey feathers... and of course we didn't see them, probably because we had the camera along. We have been discussing an outing tomorrow. The weather is supposed to be warm and sunny till the weekend. The Captain doesn't want to run again till Saturday and we are not ready to head out cruising yet... so I suggested a hike somewhere... and he countered with running some errands in the City and a trip to the driving range. Hah! He knows how to get me - I would give up pretty much anything to get my golf clubs in my hands, even just at the driving range. So. Yes. Please. Let's. I can hardlly wait. We used to be avid golfers - The Captain since he was a kid; I took it up much later. But when we bought the sailboat, the seasons overlapped too much and golf has become a rare, special event in the warmer months. Sometimes we golf in the winter if it is warm enough here, like it was last year, or if we travel further South. Hmmm... what shoes shall I wear? I think I will celebrate with a No Pudge Brownie and some more of my strawberries. broccoli slaw is SO good. Perfect meal for it too! I love it... and it is one way I can get The Captain to eat a bit of broccoli too! LOVE YOUR BLOG!!! You were right about my stains ha! I want to go golfing!!! I am so happy tht the weather is going to be good!! I LOVE broccoli slaw, my fave! Thanks so much. I am glad to see you here.